A being is free only when it can determine and limit its activity. They had Shabbat at the sleep-away camp I went to when I was ten, and I wanted to take it home with me. I made a pretty challah cover in arts and crafts, and carefully packed it in my suitcase to try to take Shabbat home, but it didn’t work. The challah cover just stayed on a shelf in the linen closet after I unpacked it. Years later, I found the lavender and white carefully needlepointed cover neatly folded in the back of the closet, after I returned from a trip to Israel one summer. I pulled it out and tried to bring the Shabbat I had experienced in Israel into our home. This time it lasted for two sweet Friday night dinners. Then I must have forgotten about the challah cover again. Other stuff seemed more important. It wasn’t until I lived within a community of people who observed Shabbat that I finally got to experience it on a weekly basis. For a person who is very driven, it is a healing oasis. I don’t think there is anything but a higher spiritual purpose that could get me to stop wanting to accomplish more things. When I finally began to welcome Shabbat on a weekly basis, I heard the expression that Shabbat is the “pause that refreshes,” and that just fit so perfectly. It fits even more now than ever before. Now, it’s a chance to unplug from all the ways in which we are wired. This past Shabbat I was pondering how Shabbat becomes even more noticeably distinguishable from every other day of the week as we progress technologically. Shabbat moves in, and we lay down all the gadgets that accompany us all week long. We are left with just ourselves—and the people right around us. It feels so gloriously natural and old-fashioned—but there is no way I would free myself up in this way without a strong spiritual incentive motivating me. It’s ironic, because from the outside it may look like those of us who are observing Shabbat are curtailing our freedom, but I know there is no other way we would release ourselves from all our gadgets. We are actually choosing to “disconnect” in order to more fully reconnect spiritually one day each week. It’s fitting that we use the expression, “observing Shabbat.” Shabbat becomes the only chance we give ourselves each week to slow down and observe the people and places that are beside us. It provides us with time to more fully appreciate and savor all the blessings we can see (like candles shining) and feel (like welcoming hugs) and taste (like warm challah) and smell (like chicken soup simmering) and hear (like singing together, and even conversing with a real live person next to us). We’re all here on our unique spiritual journeys—searching for different missing parts. Shabbat gives us the time and space to be mindful and observe where we are on our journeys. When we slow down to a Shabbat pace, we can pause to reflect upon the week that has passed, what its highlights were, and hopefully, reconnect with our purpose. That challah cover I once made in camp got used so many times after I got married and was blessed with children that it became irreparably stained—with lots of spilled cups of wine and grape juice. We eventually replaced it, and for a while our little ones played pretend “Shabbat” with my old stained challah cover—on regular weekdays. We get lost from our purpose again and again in our lives. It’s coming back to it that is miraculous. Bracha Goetz is the author of 30 Jewish children’s books that can be found in Jewish bookstores and online here: http://www.amazon.com/author/spiritualkidsbooks-brachagoetz. This story is due to appear in the upcoming anthology, Chicken Soup for the Soul: The Joy of Less, which is scheduled for release on April 19th. If the goal of your Shabbos table is to create a positive and unifying experience for participants of all ages and backgrounds, here are some simple techniques that encourage everyone’s participation. This format is wonderful for those who would like to invite guests who may be less familiar with Shabbos customs, but it works equally well any family or group, as well. The set up of the table should be to form one “circle”, so each person can have eye contact with every other person seated. It’s best not to have a separate children’s table or a T-shaped configuration, if possible. It is also helpful to have bentchers on the table, set at the places, or handed out to the guests. This is often a good job for one of the children. Remember to announce the page if you have guests that may not be familiar with the songs (Shalom Aleichem, Eishes Chayil, Shabbos zemiros). “Newcomers” that are not familiar with the songs, should be given an English/Hebrew version or a siddur to at least follow along reading to themselves in English, so they get a sense of what is being said. Introduce the concept to newcomers in a phrase that explains the meaning of Kiddush. It could be somewhat like this: “Kiddush is to testify that G-d created the world in 6 days and rested on the 7th day. We emulate this concept by refraining from creative work on Shabbos. The second theme of the Kiddush is that HaShem brought the Jewish people out from slavery in Egypt and formed them into a nation and gave them the Torah. Shabbos is one of the gifts in the Torah.” If there is someone who is not familiar with the washing of the hands, make sure someone in the family explains this procedure and recites the blessing of al netilas yadiam with him or her. Casually mention that there is no speaking between the hand washing and the distribution and eating of the challah. New guests enjoy this a lot! After the first course is served and everyone has some food on their plate and in their stomach, we begin “introductions”. Going around the table, I start (so I can model what I want to happen) and we go around to the right (counter-clockwise). I ask each person to say his or her name. This is especially helpful when there are guests who may not know the names of the children or the names of the other guests. I say something like, “Please say your name, since everyone may not yet know everyone else”. It is a helpful icebreaker at the start. Also, I ask each person to answer the “theme question” after they introduce themselves. The theme question is a one or two word topic to which everyone will be able to relate, and it has an “open ended” style. We are not looking for one ‘right answer’. Whatever comes to mind is a good answer. The topic is related either directly or indirectly to the weekly parsha. I announce the name of the parsha and then the theme. For instance, for parsha Bereshis the theme might be “garden” or it might be “tree” or any other related word, for Noach, some example may be “flood” or “animal”. One person may end up discussing the time that his basement flooded, and how he reacted. Another guest may talk about a big storm and how it affected her life. The theme question gives people a chance to express themselves in a non-judgmental context. It works for all age groups and encourages speaking as well listening skills. Everyone gets to know what the others are thinking. Parents can get an insight into what is on the minds of their children. If someone can’t think of something to say relating to the theme, he can just state his name and ‘pass’ until everyone else is done and we can come back to him when he is ready, if he would like. The theme question is a great segue way to the Dvar Torah. When the children are younger, they are asked to speak about something they learned in school or discuss a point from their ‘parsha sheet’. Starting from youngest to oldest, keeps an orderly flow and allows the younger ones to say something that had not yet been said, since they are going first. After a young child has his or her turn to speak, he or she may want to leave the table to play if it is too much for them to pay attention to the others. They should be allowed to leave the table after their turn by asking permission. This allows the meal to be child-focused and not guest- focused for as long as it is enjoyable for the children, and the guests gain much as well by focusing on the children’s presentations. When the children got older, I gave the Dvar Torah first and asked anyone (child or guest) who had something to share, to do so. Over the years, the children gained self-confidence in public speaking and listening skills. Some young children love the “public speaking” opportunity so much, they stand up on their chairs when their turns come. As the main course ends, the singing of the zemiros is a cue for the plates to be cleared from the table. One can ask a newcomer guest if he knows any Jewish songs or a guest can choose the zemer or lead the tune, if they are willing. The concluding question is called the “dessert question” because it is answered while dessert is served and eaten. The question is the same each week but the answer always differs, because each week has brought new experiences. The question is: “What was the highlight of your week?” This encourages people to think back from last Shabbos until now, review their week, focus on a positive experience, and share it with others. There is no particular order to answer the “dessert question.” Anyone who is ready to share their highlight, may start. It also encourages thankfulness to HaShem for many blessings. I thank my wife for the delicious meal, if I haven’t already done so, and all those who assisted in preparing, cleaning up or bringing something for Shabbos. We bentch together, as this brings closure to the meal. Afterwards, those who want to leave the table are free to do so. Those that would like to stay and talk are welcome to stay at the table or go into the living room. It is important that people (especially children) should not be “held hostage” at the table for too long. Children who have left the table should be called back for the dessert question and the group bentching. We usually sing the first paragraph in unison. Our Shabbos tables have the potential to be unifying opportunities for participants of all ages and backgrounds, just by making a few simple accommodations. I hope this provides some ideas with which to experiment and enhance Shabbos pleasure! Rabbi Aryeh Goetz is the Director of Neighborhood Investment for CHAI (Comprehensive Housing Assistance, Inc.) and rabbi of the Jewish Recovery Houses in Baltimore, Maryland. He can be reached at aryehgoetz@gmail.com. Prior to the Shabbos Project, Rabbi Dr. Warren Goldstein spoke in Kew Garden Hills about the project. (link) He stressed that it was not primarily a kiruv project, but rather an opportunity to help non-observant Jews experience the transformative nature of Shabbos. There is no doubt that Shabbos can be transformative, but when we look at those leaving Shabbos observance, or observing “half-Shabbos”, or lightly observing Shabbos, or at our own observance, it becomes clear that the degree of transformation is variable. This is my Shabbos Project takeaway, how can I make my Shabbos more transformative. Here is an excerpt from Rabbi Dessler’s piece, “Shabbos and Olam Ha-Ba” in Michtav M’Eliyahu (Strive for Truth – Part Four) to help us understand the potential transformative nature of Shabbos. Shabbos, the concept of rest, provides the goal of the physical universe — the world of restlessness. By “rest” we do not mean the dead state of inaction and laziness. This indeed is the antithesis of true being. We mean rest from the perpetual turmoil of material demands. This still center within the hurricane of life is the essence of the spirit. Here we make contact with God’s revealed presence in the world. This indeed is the goal and perfection of creation. God completed all the work in six days, and we too are commanded, “You shall labor for six days and do all your work” (Shemot 20:9). The Rabbis ask, “Can one complete all one’s work in six days?” The answer is that, of course, on the material level one’s work is not done. But on the spiritual level, when Shabbos comes we should feel as if we have nothing more to do; worrying about one’s work is now out of the question. This is a spiritual level which is not easy to attain. How can one help thinking about the multitude of things left unfinished which will have to be attended to in the coming week? But Shabbos represents the higher-level knowledge that God is in charge and that, in essence, there is nothing to worry about. One can be so immersed in the sanctity of Shabbos that one has no more room in one’s mind for that important business deal that was pending when Shabbos came in. All mundane matters shrink into insignificance compared to the tremendous holiness of Shabbos. They are, after all, only the means to an end, while Shabbos is the end itself — the spiritual goal of all creation. This is the meaning of “Remember the Sabbath day to keep it holy” — “Remember the Sabbath day during the week and arrange your business activities in such a way that you will be able to take your mind off them on the Sabbath” (Sforno on Shemot 20:9). In view of all this, it may seem incongruous that the Rabbis require us to honor Shabbos not only with prayer, Torah and song, but also with good food, fine linen and bright lights — all definitely physical attractions. They learn this from the words of the prophet Yeshayahu (58:13): “You shall call Shabbos oneg (a pleasure), and give honor to God’s holy day.” ‘Pleasure’ here means physical pleasure, the Rabbis explain. On the other hand, the Zohar (III, 94 b) teaches that oneg refers to the spiritual delight of being close to God. There is no contradiction. Of course the essence of Shabbos is spiritual joy and serenity. But we are human beings, and it is human nature to express one’s joy with food and drink and fine clothes. By these means we reinforce in ourselves the honor due to the spirituality of Shabbos. The holiness of Shabbos is so great that it can absorb these physical pleasures, and others too, into the sphere of spirituality. It is this transformation of bodily activities into the sphere of holiness which is the hallmark of Olam Ha-Ba. In Bereshit 2:3, we read that God blessed the Sabbath day. But blessing means expansion — unlimited expansion of opportunities for spiritual progress — and a day is a limited amount of time. How can a day be blessed? Shabbos brings us a sense of closeness to God. It is above time. The more a person appreciates the essence of Shabbos, the closer he is to transcending the boundaries of the everyday. If he experiences real pleasure in the realm of the spirit, no limit can be set to this progression. The real blessing of Shabbos is the expansion of one’s consciousness from preoccupation with the trivialities of this world to immersion in the spiritual world. This is the “inheritance without bounds” which is promised to the one who takes pleasure in Shabbos. Here, too, we forge a link with Olam Ha-Ba. Is Judaism a meritocracy or an aristocracy? Why do we dwell in our Sukkos on Shabbos but do not fulfill the mitzvah of Lulav on Shabbos? Why is a stolen Lulav invalid for performing the mitzvah when one does fulfill the mitzvah of Sukkah in anothers Sukkah? The crown of Torah lays at rest; waiting and ready for all, as the passuk declares: “The Torah which Moshe commanded us is the inheritance of the congregation of Yaakov” (Devarim 33:4). Whoever desires may come and take it. Lest you say that the other crowns are superior to the crown of Torah, consider that the passuk declares: “By me [Torah], kings reign, princes decree justice, and nobles rule” (Mishlei 8:15,16). Thus, you have learned that the crown of Torah is greater than the other two. Today is to do them (the mitzvos) and tomorrow is NOT to do them. Today is to do them and tomorrow is to receive their reward. Judaism contains elements of both an aristocracy and a meritocracy. On the one hand being a Kohen, a Levi or a candidate for Moshiach– the Messiah; is purely an accident of birth. Jewish identity itself is determined by biological matrilineal descent while tribal identity is determined by patrilineal descent. But on the other hand our sages teach us that a mamzer-one born from a kares prohibited union; who is a talmid chacam-Torah scholar; takes precedence over a Kohen Gadol-High Priest; who is an am haaretz-ignoramus. Anticipating sociological patterns, Chazal comment “take heed of [the dignity of] the children of the impoverished, for Torah [scholarship] shall emanate from them”(Nedarim 81A) and “[why is it] that the sons of talmidei chachamim are rarely talmidei chachamim themselves?” (ibid). Some of history’s greatest Jews e.g. Onkelos, Rabi Meir and Rabi Akivah were geirim-righteous converts; or their descendants. On this level Judaism is the ultimate meritocracy with no glass ceilings that impede upward social-spiritual mobility. We will see that paradoxically; the aristocratic, heredity-based aspect is actually the more egalitarian, classless of the two elements whereas the meritocracy creates a stratified, multi-tiered hierarchy. Based on two Halachic differences between Sukkah and Lulav-the four species; the Izhbitzer understands the two mitzvos of the holiday in light of the hereditary- and merit-based components of kedushas Yisrael-Jewish sanctity. On Shabbos the Halachah exempts us from fulfilling the mitzvah of Lulav whereas we are still obligated in the mitzvah of Sukkah. The reason for the contrast is that Shabbos is a scintilla of Olam Haba-the Coming-World wherein avodah-serving the Creator through the exercise of free-will; no longer exists. There (then?) all that the person toiled to acquire in the here-and-now world through his choices and actions are secured in his heart. This is why all 39 categories of creative activity are prohibited on Shabbos. Whether we are speaking of our weekly Shabbosos or “The Day that shall be entirely Shabbos and eternal rest”, only one who has exerted himself on Shabbos eve will enjoy the fruits of his labors on Shabbos (Cp. Avodah Zarah 2A). Sukkah is an effortless mitzvah, one is merely “there.” Sukkah represents the hereditary kedushas Yisrael present in the heart of every Jew passed along like spiritual DNA from the patriarchs. The mitzvah of Sukkah resonates with same the kind of “all our work is done” sensibility that inform Shabbos and Olam Haba. But Lulav, which we take up in our hands and move in every possible direction of human endeavor, is characteristic of all mitzvos maasiyos– the mitzvos requiring decision-making, exertion and activity. The Izhbitzer’s disciple, Rav Laibeleh Eiger points out that the gimatriya-numerical value; of Esrog is 610. When we count the other three species used to fulfill the mitzvah along with the Esrog the sum is 613, the precise total of all of the mitzvos. The 4 species embody every possible avodah endeavor. There is something very proactive, workmanlike and this-worldly about Lulav that makes it inconsistent with Shabbos. Moshe gathered the entire assemblage of the Bnei Yisrael , and said unto them: ‘These are the words which HaShem has commanded, that you should do them. Six days creative activities shall be done, but the seventh day t shall be holy day for you, sabbath; a day of complete respite for HaShem. Whoever actively creates in it shall be put to death. And let every wise-hearted person among you come, and make all that HaShem has commanded. The Mishkan-tabernacle, its tent, and its covering, its hooks, its vertical boards, its bars, its pillars, and its sockets. The Ark etc. Rav Yehudah said in the name of Rav: Betzalel [principal artisan of the Mishkan] knew how to bond and combine the letters through which heaven and earth were created. How did Moshe gather everyone together, and forge them into a unit? Why is the commandment of building the Mishkan preceded by the commandment of Shabbos? The roots of human ga’avah-ego and egotism, lie in the self-perception of individuality and specialization. That which we specialize in is what makes us salient and exceptional. “I am what YOU are not. I am capable of what you are incapable of, or, if your are capable of the same, I can do it better than you can.” We are proud of what sets us apart and so; what separates and divides us is our pride. As any manager will tell you, a major part of teamwork is the surrender of ego. There is nothing more ego-deflating than to feel that one is a fungible, interchangeable part in a larger entity, a mere cog in the machine. But for collective entities to coalesce and integrate the balloons of ego must first be deflated. Logically, custom-made items should not be able to dovetail or interlock. Yet; although the Mishkan was fabricated by individual craftspeople, each proud of their own unique talents and style, the individual components that they crafted were stitched, hooked, inserted in sockets, ringed or staved together to form a seamless whole. Oblivious to it at the time they plied their supposedly unique, inimitable specialties; they all conformed to the precise specs of a master plan. The Mishkan reduced one-of-a-kind artists to molds and die casts in a mass production assembly-line. When the Mishkan was complete and all could see how harmoniously everything fit together this observation raised their consciousness of the siyatta diShmaya-the Divine assistance that worked It’s Will through them. They experienced a collective epiphany that it was HaShem, not they, who had actually built the Mishkan. They came to realize that they were no more than the proverbial garzan b’yad hachotzeiv– the ax in the hands of the lumberjack. The ax is an integrated implement uniting blade, handle and the pegs that bind them. Even if the ax was composed of sentient beings the blade could still not lord it over the handle or the pegs for none could accomplish their task or fulfill their role without the others. Moreover, even when their tree-felling missions are accomplished , the humbling realization that “axes don’t fell trees … lumberjacks do” would unite them in their true, cooperative, integrated identity as the lumberjacks implement, rather than as free-lancers working on their own. The Izhbitzer asserts that Shabbos is the key to this awareness. The Shabbos concept lies at the core of every mitzvah performed l’shemShamayim –purely for HaShem’s sake with no ulterior motives whatsoever. He goes so far as to say that they are synonymous, that intent l’shemShamayim IS Shabbos by another name. I’ll attempt to offer a possible explanation for the Izhbitzer’s enigmatic axiom. The Midrash teaches that the Divine Will for creation is described as nisaveh lo dirah b’tachtonim –He yearned for an abode amidst the lower spheres. (Tanchumah Naso 16) This seems odd. HaShem is transcendent, Existing outside of time in non-chronological terms; so how can any given time play host to HaShem? HaShem is omnipresent, Existing outside of place in non-spacial terms; so much so that Chazal tell us that HaShem is nicknamed HaMakom-The Place, because “He is the Place of the cosmos, the cosmos is not His place” (Bereishis Rabbah 68) so how can any given location serve as His abode? Yet … we also know that kedushas haz’man and kedushas hamakom – sanctified time and space are real, not delusions. HaShem’s dwelling place within the lower sphere of time is Shabbos. He ceased creating on the seventh day for His Will, that all of creation declare His Glory, had been done. When, in perhaps the ultimate act of halicha b’drachav- imitatio dei, shomrei Shabbos cease their creative activity, they bear witness to the veracity of the Torah’s Genesis narrative. More than that, they bear witness that the creative activity of Genesis could cease because the goal of creation had been achieved. HaShem had his abode in the lower spheres in a cosmos in which every infinitesimal component part, and the grand macrocosmic whole that is greater than the sum of its parts, declare His glory. And so, every mitzvah performed l’shemShamayim, for HaShem’s Will and Glory alone, is yet another iteration of Shabbos; the accommodating time in the hospitable place in the lower spheres that provide HaShem k’vyachol, with a glorifying abode. How did Moshe congregate everyone? How did he instill unifying humility in the hearts and minds of the formerly prideful, specializing craftspeople who, collectively, built the Mishkan for the Shechinah-HaShems Divine Indwelling? By first commanding them to observe Shabbos and by making the Shabbos concept clear to them. Just as HaShem did not bless and sanctify the seventh day until all the work was done, until the cosmos was complete and perfect so too He would not allow His Shechinah into the Mishkan until it was complete and perfect. Had one peg anchoring the curtains of the Mishkan’s courtyard been missing or not engineered according to specs, the Divine Indwelling would have remained in the upper spheres. How then could the fabricator of the aron habris-the Ark of the Covenant have felt superior to the peg maker? One and all the artisans and craftspeople had been an implement, the ax wielded by the Divine Lumberjack. …it starts earlier. I know that some of us think this, but I’m saying it. Hear me out, it’s the same 25+hours. While I am all for a long afternoon in the “Shabbos” park and playdates that seem to go on for hours, I like the winter months. I happen to like the fact that in the winter, I can chose to go to a longer Shabbos night davening (like a Carlebach-style minyan) and not have to worry about keeping my family starving and waiting for me at home. I like the fact that after dinner, my wife and I have time to spend with our kids without feeling guilty about keeping them up late. We often play games, schmooze, and on occasion, I have learned with my older kids. Also, our shul has an oneg every few weeks at the home of our Rabbi, so it’s nice to be able to get out and socialize, as well. The truth is, Shabbos gets better and better as we and our children get older. Having children in kindergarten, fourth grade, and sixth grade means that they sometimes play together, are able to initiate and participate in parsha-based discussions and general “table talk”. My son, recently was learning the halachos of kiddush in school and mentioned that by drinking from the kiddush cup and pouring the wine into other cups, I am creating in a “Kos Pagum,” a “deficient cup,” from which it is improper for anyone else to drink from. After looking up his source (the Kitzur Shulchan Aruch), researching it, and consulting my Rav, we altered the distribution of the kiddush process. Had my son not been learning this, we would have never changed our system. My two older children also are in sleep over mode. Sometimes they will will have friends sleep over and other times they will sleep someplace else (for Shabbos or after Shabbos). Not only does this allow our children to be exposed to how other Torah homes operate, but it gives them a feeling of independence. As someone who started keeping Shabbos when I was 16 (now I am 41), I never went through the often rough transition of switching in my adulthood to Shabbos-mode (like the oven). In the end, Shabbos is totally what you make. It was a busy Tuesday morning in the Jaffe household, and since I prepare early for Shabbos by chatzos, Shabbos was on my mind. I put the ingredients into my mixer for my challah, which I often make ahead for the freezer. As the mixer was doing its thing, I reached for the phone. Mistake number one: When making challah, focus on the challah; let the voice mail get the phone. On the other end of the phone was what I considered bad news. A project that I had invested a number of months into was ending prematurely, at the potential loss to me of several thousand dollars. Mistake number two: Where did my bitachon go? I got very busy making phone calls and trying to fix the problem. I got myself so emotionally worked up, I decided to go exercise, to release some of the adrenalin flowing through my body. Then, once I was out of the house, there were some errands to run, and four hours later, I returned to my home to pick up mycomputer and briefcase before leaving for my teaching job at Yeshiva at IDT. When you walk in the front door of my home, the ground level is all one large room. My kitchen at the back of the room opens up to the dining area, which flows into the living room and my office, all of it within sight of the front door as I stepped into the lobby. From across the room, my challah dough called out to me. YOU FORGOT ALL ABOUT ME! Yes, I did. The mixer had stopped mixing hours ago, but the dough in the mixer continued to rise, ballooning out of my mixer to the size of a small beachball. I couldn’t stop laughing, when I wasn’t chiding myself about what kind of a woman are you to forget all about your challah dough? I was on my way to work with only minutes to spare, so there was no time to bake the dough. I punched it back down into a small enough dough ball to fit into the largest mixing bowl I have, covered it with saran wrap, apologized once again to the dough for neglecting it, and placed it in my spare refrigerator to rise for the rest of the day while I was teaching in yeshiva. 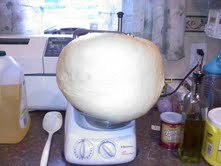 I braided and baked the dough that night and hoped that this unplanned experiment in rising would work. That Shabbos, we enjoyed the best challah I have ever made. Apparently, it forgave me for my neglect, enjoyed it’s extended rising time, and produced for our family a taste of ganeden. Later on that week, I was asked to give over a shiur on the chazzak phone line, (personal story 105#) which I readily agreed to do. Incorporated into my shiur was the story of my rising dough, which I saw as a metaphor for all those times when I am busy at my computer, and one of my children is requesting my attention. I asked the question in my shiur: To what extent to our family members feel they need to act like this dough did in my mixer, rising and getting larger and larger and essentially shouting across the room: “You’ve neglected me!” before we pay attention. What Do You Eat On Shabbat? We all know that food plays an important role in our Shabbat routine. We know that we have a halachic obligation for three Shabbat meals. Many of us know that the Ari emphasized a kabbalistic importance to these meals. And many of us are very much set on a particular menu for Shabbat. This is not a deep post. Yet the Torah we live encompasses all aspects of our personal and communal culture; and so this, too, is relevant in some way. I have Ashkenazi friends in the NYC area who think that if you don’t have cholent on Shabbat, you’re some sort of heretic. Or at least insufficiently respectful of the hallowed requirements of Judaism, and maybe to be held in slight suspicion as ignorant or unreliable. When I ask them what they think Jews ate on Shabbat in Teheran, Halab, Fez, Saana, or fill-in-the-blank – they give me a blank stare. The truth is, what people eat on Shabbat has much to do with personal taste, local culture, and what’s available. Here in the American Southwest, we are especially blessed with deservedly famous hot chiles. In the fall, parking lots all over town host chile roasters. Farmers bring their produce in burlap sacks, and roast it fresh for the customer. Even the supermarkets offer this service. The smell of roasting chiles permeates the air for a few weeks each fall. Most of us buy a quantity (15 or 20 lbs is common) to freeze and last till the next crop. So, on a recent Friday night, for instance, we had the sort of meal that many of our New York friends (the majority Ashkenazim, anyway) wouldn’t quite understand. We started with hummous. We had three types of schug. Our neighbors just made their first batch of Santa Fe schug using chiles from their garden. Both the green and the red were very good. And we had some of the schug that I had brought back frozen in July from Bnei Ayish. Very tasty, with a mild sweat breaking the brow. It happens we skipped the fish. If we had fish, it likely would have been smoked salmon. Sometimes we have a Yemenite salmon (‘Moriah’s salmon’) recipe. A few times a year my wife will make salmon ‘gefilte fish’. Our neighbors will sometimes serve sushi. I, of course, put schug on my fish. And we rarely ever have typical whitefish/carp gefilte fish in our house. After a quick zemer/song or short reading from the Nechama Leibowitz biography we’re enjoying, it is time for the main dish. Chicken? Beef? Could be; but our classic and favored by far meal is green chile stew. Served in bowls, with spoons. Bits of lamb and vegetables with lots of hot green chiles. And an extra napkin just for wiping the sweat off the brow. The stew is excellent with a dry red wine, or beer. It awakens nerve endings in the mouth you might not know were there. I remember when Beit HaTfutzot/Museum of the Diaspora opened in Ramat Aviv some 30 years ago. There was an excellent exhibit, like a modern diorama, or a Jewish home on Shabbat. But this exhibit changed before one’s eyes, to show how Jewish homes around the world were similar, yet different. Certain items were in place in each version, with changes of local style; while other items like foods and clothing varied. In New Mexico, the hot chile pepper is culinary king. For many of us, that bears a strong influence on our Shabbat cooking. What local influences shape the way you eat on Shabbat? Jacob Da Jew recently wrote a post about how his brother-in-law recently joined the workforce, and now truly appreciates the “rest” you take on Shabbos. For me, it was the opposite. I wasn’t Shabbos observant until about 2-3 years ago (I never did mark down the exact day I started). Before that, I couldn’t figure out how people could observe Shabbos. After working all week, I eagerly awaited the weekend to do all the other things that needed doing. Shopping, going out, having fun, taking rides, etc. When I married my observant wife, she said she accepted me as I was, and would not change me to try to make me Shomer Shabbos, kosher, etc. And for the first year or so, that’s what it was. In fact I used to teach motorcycle classes once a month over the whole weekend. But something happened. I began to miss the Friday night Shabbos dinner. Eventually I made arrangements so I could be home on Friday night, but still teach Saturday and Sunday. But then something else happened. Now I was missing going to Shul! Huh? Where did this come from? I used to only go to Friday night services a few times a year. Now I’m disappointed that I’m not at services on Shabbos? Hmmmmm. Okay, so now I don’t teach on the weekends anymore. But still, gotta have my e-mail! I check it several times an hour when awake! Well, hmmm, I guess I really don’t get all that much email on Saturday. Maybe I don’t need to check that often. You know what, I don’t need to check at all. Let’s just turn the computer off before we light the candles. Give the hard drive a rest from its constant spinning. Boy, this is really going to be boring. For over 24 hours, no TV, no computer, no driving around and shopping. What the heck will we do anyway? Well, Shabbos dinner on Friday night is nice. Good family time. Saturday morning I get the kids up and let my wife sleep in a little bit. Then when she’s up (maybe with a little nudging from me) I go to shul (the wife and kids will join me later) and I really enjoy davening there. In the afternoon, I play with the kids, or they go to a neighbor’s house and run around wild there, and I get to take something I haven’t taken since Kindergarten… a nice nap. Some dinner, then if Shabbos ends early enough, Havdalah for the whole family, otherwise we put the kids to bed, and a little private time to talk with my wife before Shabbos ends. You know what? I like this! I don’t miss the Saturday hullabaloo I used to participate in. It’s nice to get a rest in, take a break from the average week. I’ve turned 180 degrees, now instead of being annoyed with Shabbos “interfering” with my schedule, I actually look forward to it and the break it gives me every week. Birthright was in Bayit Vegan a number of weeks ago. We were lucky to have two guests for lunch who–like most of the participants–had never been to Israel. After shabbos, while mulling over Steve’s question, I was reading Jonathan Lear’s great book on Freud. Searching for a metaphor to describe what he does as an analyst, Lear turns to shabbos: the psychoanalytical encounter, he writes, is like ‘an existential Sabbath.’ This wasn’t so much an Oprah ‘aha!’ moment, but more like a Freudian ‘uncanny’ moment–the experience of the unexpected connectedness between things. Lear turns to shabbos to describe the development of the psyche; but, I thought about going in the other direction: looking to psychoanalysis as a mashal–a metaphor–for shabbos. In a metaphor, Aristotle writes, the ‘unknown or half-known is described and clarified through recourse to what is better known.’ With Tony Soprano in therapy, psychoanalysis, I thought, may help to understand shabbos. Neurotics (everybody has a friend or relative in this chategory, no?) have a tendency to repeat their behavior. Freud once overheard his father saying of him: ‘the boy will never amount to anything!’; the master of the pscyhe repeated this in psycho-dramas played out through the rest of his life. In Freud’s repetitious behavior, he broke off relationships with colleagues, collaborators, patients and friends, as if to say to them: ‘it’s not me, but you that has not amounted to anything.’ But we don’t need to turn to Freud for examples: we’ve all had the feeling–at least once–that a friend or relative isn’t reacting to what we’ve said or done, but instead relating to us through the lens of another relationship. To which we may respond, ‘hey, I’m not your mother!’ Without being aware of the unresolved tensions that motivate him, the neurotic lives in a world of fantasy, endlessly playing out the same drama. The ‘sabbath’ of the psychoanalytic session, Lear writes, ‘allows a person to take an hour’s rest from normal life’ in order ‘to experience an interpretive breakdown’–thus allowing for a ‘special conversation.’ Here it seems that any comparisons between shabbos and psychoanalysis should have been put aside. Imagine me saying: ‘you see Steve, the reason we keep shabbos is so that we can have an interpretive breakdown.’ I’m sure that would have done the trick! But in its way, shabbos does involve its own form of ‘interpretive breakdown’–where refraining from day to day activities, and the habits of mind which accompany them, opens up a space for a ‘new conversation.’ Shabbos cultivates an awareness that the mindset that governs our week, especially our certainty that we are in absolute control over our destinies, is in fact just a fantasy. The Torah recounts the giving of the ten commandments twice–once in Exodus, and then in Deuteronomy. One of the differences in these separate accounts appears in the fourth commandment: the Exodus version reads: ‘Remember the Sabbath Day’; while the version in Deuteronomy reads ‘Keep the Sabbath day.’ The discrepancy does not cause the Sages to start an Institute for Biblical Criticism, but instead, they explain that the divine utterance included both remember–זכור–and keep–שמור: though there was one utterance, both were expressed. The Maharal explains that though remembering shabbos (zachor) comes first, ‘keeping’ (shamor) is of greater importance. Shamor means refraining from weekday activities; zachor is an active rememberance through, as the Maharal emphasizes, a verbal proclamation (בפה). But without shamor, refraining from labor, the zachor has no effect. It simply get drowned out. You can’t, the Maharal explains, get in the car, drive to the beach, stop off for gas, go to the MacDonald’s at the rest stop, and then take out your kiddush cup to proclaim the holiness of the day. For the rememberance of shabbos to be heard, one has to refrain from weekday activities. [Editors note: there was no beach in Prague; it’s just a metaphor]. Shabbos, the kabbalists tell us, is not only a day of rest, but a day of דיבור or speech. Because we rest, and remember ourselves outside of the endless dramas of the weekday world in which we knowingly (or not) are too involved, we have the capacity for a new kind of speech. The proclamation of the holiness of the sabbath day, made possible by refraining and resting, is part of that new and special conversation–with G-d, our families, and ourselves. Originally posted here at Open Minded Torah. What Do You Do On a Long Shabbos Afternoon “Out-Of-Town”? I find that long Shabbos afternoons (over here, sunset can get as late as ~9 PM) present a type of programming problem; how can I seize the day and use the available time enjoyably for Jewishly meaningful activities? In our case, without young kids in the house, with extended families hundreds of miles away, and in a neighborhood sparsely populated with Jews (any type), I often descend into boredom by late afternoon. Naps are not meant to fill the time available. The Hebrew and English seforim sit there wondering why I’m so lackadaisical about reading them, now when I have the time. Where’s the fiery enthusiasm I ought to have? Does it depend on others being around to engage in the give-and-take? That is very likely, but the potential “others” have their own family lives or worthy pursuits, or maybe their own forms of boredom. So, I’ll throw this out to the readers here: What solutions have worked for you or your community under comparable circumstances to enrich the typical long Shabbos?